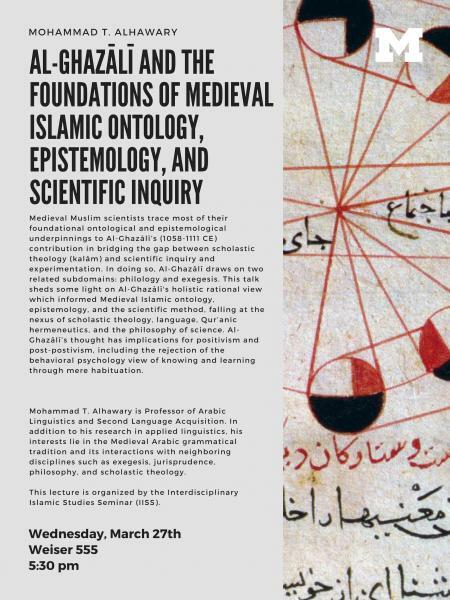 Medieval Muslim scientists trace most of their foundational ontological and epistemological underpinnings to Al-Ghazālī’s (1058-1111 CE) contribution in bridging the gap between scholastic theology (kalām) and scientific inquiry and experimentation. In doing so, Al-Ghazālī draws on two related subdomains: philology and exegesis. This talk sheds some light on Al-Ghazālī's holistic rational view which informed Medieval Islamic ontology, epistemology, and the scientific method, falling at the nexus of language, scholastic theology, Qur’anic hermeneutics, and the philosophy of science. Al-Ghazālī’s thought has implications for positivism and post-positivism, including the rejection of the behavioral psychology view of knowing and learning through mere habituation. Mohammad T. Alhawary is Professor of Arabic Linguistics and Second Language Acquisition. In addition to his research in applied linguistics, his interests lie in the Medieval Arabic grammatical tradition and its interactions with neighboring disciplines such as exegesis, jurisprudence, philosophy, and scholastic theology.